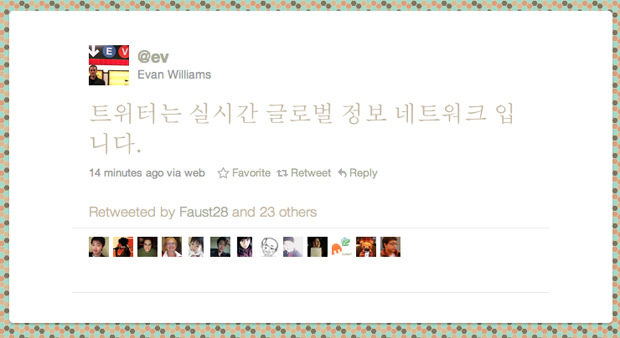 As of today Twitter users in North and South Korea can view Twitter.com, the mobile site and the iPhone and Android apps in Korean characters. Twitter has partnered with Korean web portal Daum to display Korean tweets on its homepage and Korean telcom service LG+ to make Twitter available on SMS. @oisoo posts witty Tweets, some of which were published in a best-selling essay last year. @moviejhp shares insight on his life as a movie actor. You can find comedian and TV show host @keumkangkyung and TV anchor @kimjuha on Twitter. Super Junior band members: @donghae861015, @heedictator, @siwon407, @shinsfriends, @special1004, @allrisesilver, and @ryeong9 are on Twitter. Twitter users in South Korea have grown 10x since only a year ago. There is no mention of North Korea, and its somewhat conspicuous official Twitter presence, anywhere in the post. Korean is the seventh international language Twitter now supports, joining English, French, German, Italian, Japanese and Spanish. Twitter plans on adding more languages by the end of the year, which makes sense as 70% of its user base is international.